Freeport, Bahamas - Barbados World Cup player Matthew Joseph completes the roster of top coaching talent which has been recruited to work with Grand Bahama youngsters at this year’s Sir Jack Hayward Soccer Camp. The 37-year-old international defender is now a full-time senior pro coach having completed more than 400 English league games for Leyton Orient and Cambridge United. He started his career with famous London club Arsenal and was player of the year in three out of his four seasons at Orient. 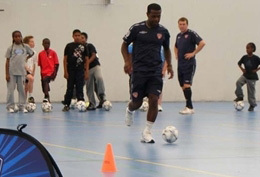 He is now responsible for a team of coaches developing soccer skills in young people in an area of the UK - East London and the county of Essex - with a population of almost two million. That’s more than six times the number of people living in the Bahamas. “In our job we get to work with kids of all ages and different abilities and it really broadens your horizons. We have a massive responsibility - to give children the best guidance and understanding we can possibly give them,” he said. “In the game itself we aim to introduce to kids fundamental skills such as balance and co-ordination while getting them comfortable off and on the ball and developing their understanding of the game generally. The highlight of Matthew’s career was playing against the USA in the 2002 World Cup qualifiers. Barbados was defeated but the USA went on to the quarter finals in South Korea and Japan, only to be defeated by the eventual tournament runners up Germany. Matthew was born in the Bethnal Green area of London but his parents’ Barbadian background qualified him to become a member of the famous “Bajan Pride” – the island’s national team. Prior to turning out for them, though, he had already won 16 youth caps playing for England. Matthew, lead coach Jamie Godbold and fellow newcomer Sarah Green are giving up vacation time to fly in to Freeport to pass on their skills and soccer knowledge in improving the game among young people on the island. “I am genuinely excited by the quality of the coaches we have coming this year. In our seven years we have always had top class people but the blend we are able to bring to Grand Bahama in 2010 has to be the best yet,” said camp organiser Richard Malcolm. “What makes it particularly excellent is that they are specialists not just in soccer coaching but in bringing out the best in young people. The camp takes place from Monday, June 21, to Friday, June 25, at the extended playing fields of Freeport Rugby Football Club, East Settlers Way. Campers get lunch each day as well as two full sets of uniform, the top level coaching and the chance of a cooling lunchtime swim in the club pool. Registration is $175 and forms can be found on this website (attached below) or collected from Town & Country, Yellow Pine Street, and Animale, Port Lucaya. More information about the camp can be had from derek.archer1@gmail.com It is not too early to register because it is first come, first served and numbers are pegged at 180.